Looking on the Internet with the hopes of finding a well built, good looking and affordable houseboat I kept coming back to the photos of this one. I contacted the original owner-builder and had a good feeling from the start. This was a work of passion by an extremely competent welder and machinist and his wife who built it for themselves. I flew from Quebec City to LaSarre in Abitibi to seal the deal. 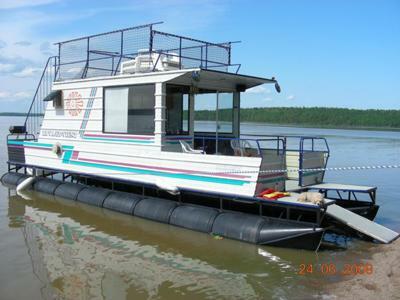 We spent the first summer on Lac-St-Jean, learning the basics skills. 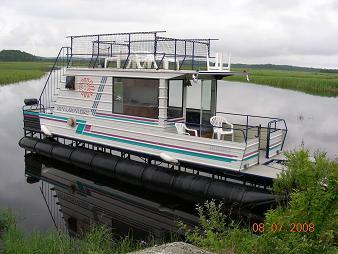 This summer we will be navigating the great St-Maurice River, more than 80 kms of wilderness. It is our summer villa, with a 360 degree view. Gaston Michel Côté, Quebec City. 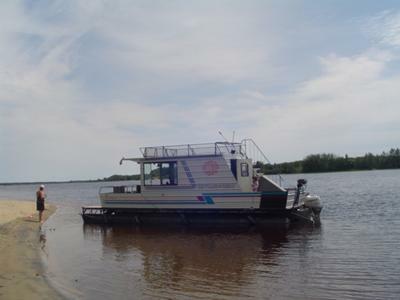 Congratulations on your houseboat purchase, and I can see from the pictures that you are fortunate to be boating in a very secluded and beautiful area. Something tells me that you will be beaching her often for some great weekend getaways. 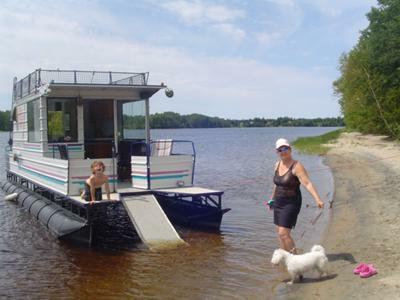 Lastly, hopefully some of our readers and visitors will share and post comments about their homemade pontoon houseboat experiences. What are those pontoons made from? They look like plastic barrels. Are they welded together?